They are round. They are pretty. They are sweet. They come packaged in lovely boxes. And they usually appear in droves as the 15th day of the 8th lunar month draws near. Yup, the Mid-Autumn Festival falls on 24 Sept this year, which is barely a month away. This means it’s time to head to your nearest mooncake fair to stock up on your mother-in-law’s favourite brand (thankfully my MIL is one chillax lady) and to go on a sampling spree. However, this much-celebrated confection can cost as much as the moon (okay, I exaggerate) and one mooncake can pack close to 1,000 calories (yikes). But I sacrificed my waistline so you don’t have to. If you’ve never heard of this retro-sounding brand, it’s time to take note. The man behind the business is Chef Daniel Tay, who founded café chain Bakerzin and cheesecake shop Cat & The Fiddle. So you know his baking skills are top-notch. This year, treat yourself to Old Seng Choong’s alcoholic Four Heavenly Beauties snowskin collection — a luscious quartet of Brandy Cherry Snowskin, Yuzu Martini Snowskin, Bailey Whiskey with White Chocolate Pearl Snowskin, and Rum & Raisin with Dark Chocolate Pearl Snowskin. I could actually feel the heat of the alcohol and I really enjoyed that every square inch of each mooncake was booze-infused, unlike the usual chocolate-coated truffle middle that needs surgical precision and a razor-sharp knife to cut through evenly. Another plus: The gorgeous tin boxes reminiscent of 1920s Shanghai. Note: Old Seng Choong does baked mooncakes, Mao Shan Wang mooncakes and other year-round/seasonal goodies as well. 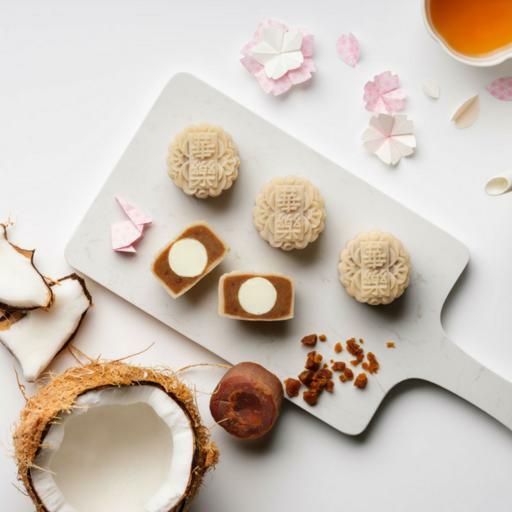 They may be small in size, but Carlton Hotel Singapore’s new Mini Gula Melaka Snowskin Mooncakes more than make up for this with its excellent and well-balanced flavour. In fact, I’d like that they stay “mini”, thank you very much. So that I can eat two, maybe three, and pretend I didn’t put on any weight (don’t judge). Also, if they were bigger, this golden ratio of snowskin to the crunchy white chocolate ball to gula Melaka to lotus paste might be tipped, and you’d end up with an overwhelming hunk of sweetness. The box, while simple and functional, is elegantly designed. It features a contemporary take on traditional Chinese landscape painting. A boatman sails into the horizon, which symbolises delivering well wishes to loved ones and business partners. There is also a couplet with greetings on the box. My MIL will definitely approve. Note: You can also go for Carlton’s other creations: Mini “Mao Shan Wang” Durian Snowskin, the signature Mini Walnut Moontart (low sugar version available) and other traditional delights. Read also: OCBC 365 Credit Card Review: High Cashback or Cashback Everyday? To me, traditional Chinese medicine has always had a bad rep of being bitter… but not the ingredients used in Peach Garden’s mooncakes. I’m really digging the restaurant’s Premium Sun-Dried Longan Infused with Red Tea Paste mooncake. This new flavour has a hint of that slightly herbal flavour, tempered with that honey-like aroma of the weathered longan. The best part, however, is when the earthy notes of the red tea paste kick in, bringing the mooncake to a mellow but delicious end. Also new is the Premium Black Dates with Melon Seed Paste mooncake. The star ingredient is, of course, the Chinese black jujubes, said to help in boosting energy levels, improving digestion and nourishing the blood. Might be an acquired taste, as the black dates are smoked beforehand, enhancing its strong, earthy character. 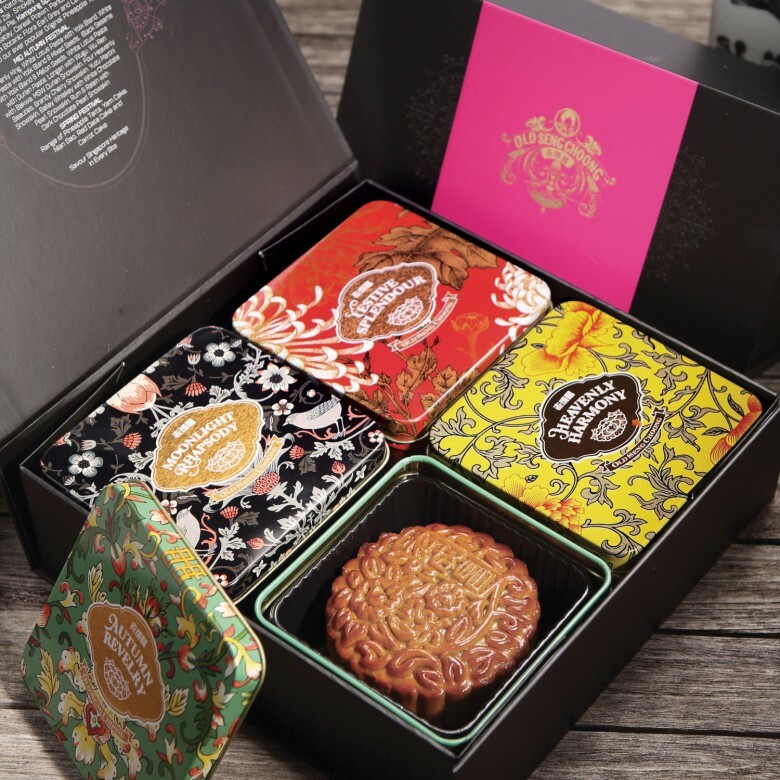 You might want to snag the set of limited edition Golden Mooncakes (includes the above-mentioned two flavours along with Signature’s Premium White Lotus Paste with Two Yolks (Reduced Sugar) and Golden Lotus Paste with One Yolk (Reduced Sugar), which are packaged in a treasure chest. These are dusted in gold and also comes with a special UnionPay Surprise Card so you can huat huat up to $16,000 in prizes. *Customers who order online enjoy 25 per cent discount throughout the Mid-Autumn period. One can’t go wrong with Sheraton Towers Singapore’s traditional baked skin renditions, handcrafted in-house by the acclaimed culinary team at Li Bai Cantonese Restaurant. With so many new-fangled creations out there, it’s getting tougher to find flavours such as the plain White Lotus Seed Paste (4pcs for $66), which is a hit with those who detest the sweet-salty-eggy combination of typically baked mooncakes with a salted egg yolk core. 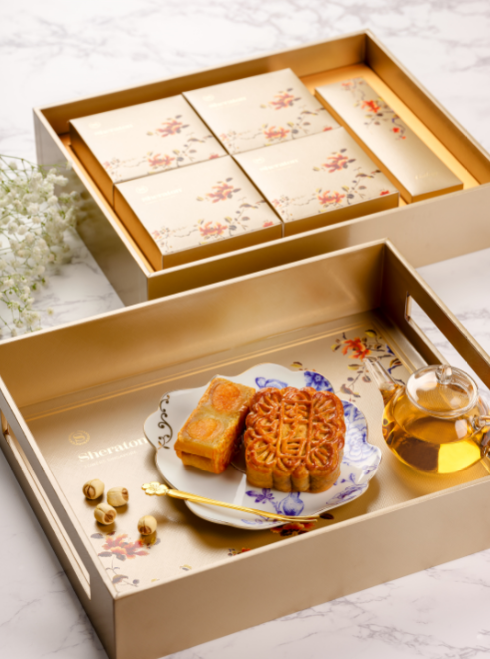 But if you love the double-yolked classic baked mooncakes, get Sheraton Tower’s Premium Box, which includes four of these traditional babies, packed in a champagne-coloured box, which can be transformed into an elegant serving tray. Note: Try also Sheraton Towers’ snowskin flavours, which include bestsellers Champagne with White Lotus Seed Paste and Lychee Martini with White Lotus Seed Paste. What’s new are the heady Black Truffle Sea Salt Dark Chocolate with White Lotus Seed Paste and the uplifting Lemon and Lemongrass with White Lotus Seed Paste. 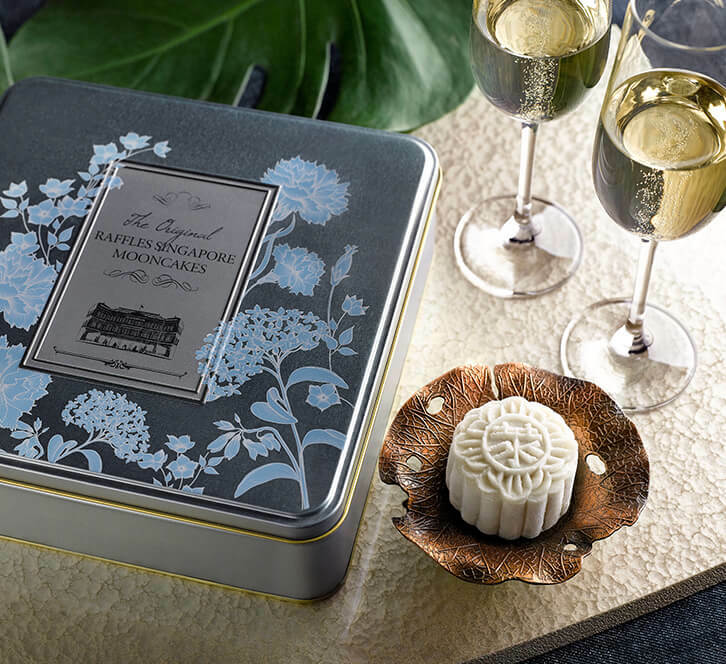 Everyone’s clamouring to get their hands on a box of Raffles Hotel Singapore’s Champagne Truffle Snow-Skin Mooncake and for good reason. Perfumed with smooth bubbly, the sought-after perennial favourite seems to reach sold-out status long before the height of the Mid-Autumn Festival — and probably even this year as well, although the historic hotel is currently undergoing restoration works. Also to covet is the charming blue-and-silver tin box that these seasonal gems arrive in. Note: Raffles’ other snowskin flavours are Cognac Truffle, Earl Grey Tea and Pearl, and this year’s new creation Açaí Berry and Chia Seeds. …the vintage Hua Diao wine, that is. Savour this in returning creation Blueberry with Vintage Hua Diao Wine mini snowskin mooncake, an unlikely but a made-in-heaven combination. 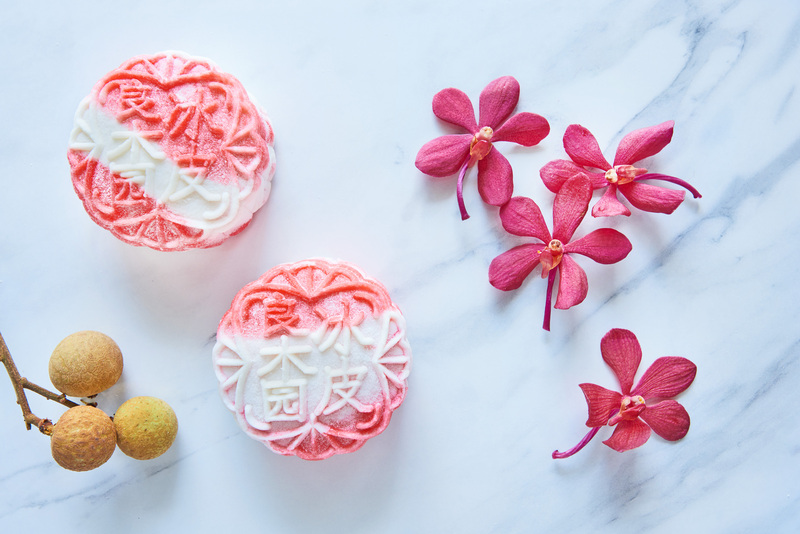 It’s available in the Hua Ting Mini Snowskin Treasures Gift Box, alongside the new Fruity Noon Tea (imagine sipping Hua Ting’s premium floral tea in a fruit orchard redolent with green apple), new Salted Egg Custard, and White Lotus Paste with Champagne Ganache (two of each flavour). Note: And how about reusing the turquoise box as your bedside lamp? 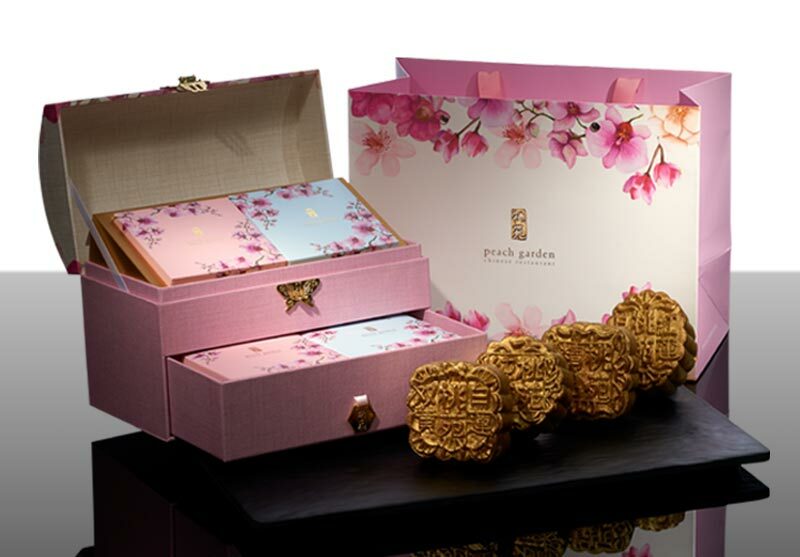 Instead of their sturdy, classy leatherette boxes, this year Orchard Hotel has come up with a premium box that comes kitted out with LED lights and a Bluetooth speaker (only for the Hua Ting Traditional Treasures Gift Box @ $104.86). Did you say Almond Beancurd with Longan (pictured), Soursop with Calamansi, Mango with Pomelo, Cempedak and D24 Durian? 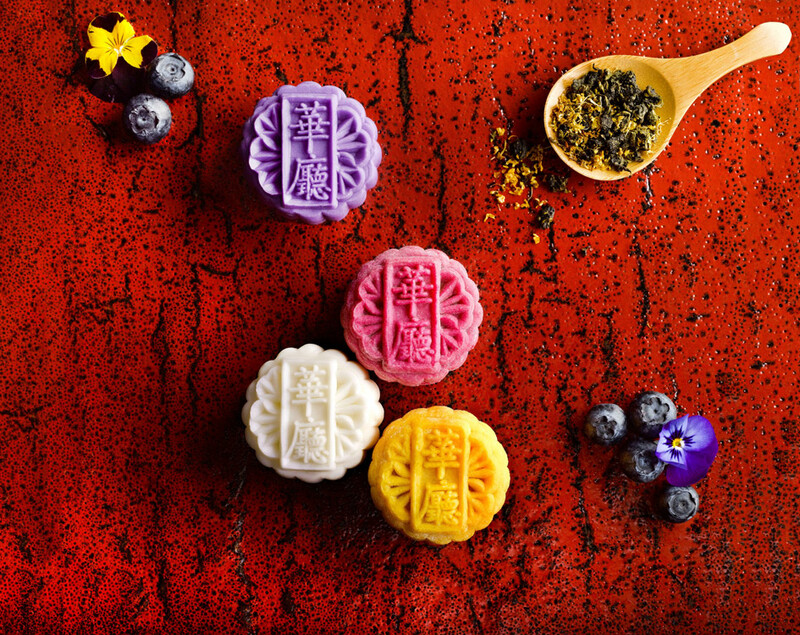 Those sound like a host of local desserts we greedily slurped up while growing up (and still do), but they are really the names of Goodwood Park Hotel’s mooncake flavours for 2018. I also enjoy the hotel’s trademark “spongey” and “marshmallow-like” snowskin texture, a welcome change from the usual dense, fondant-like wrappings of typical glutinous rice flour confections.